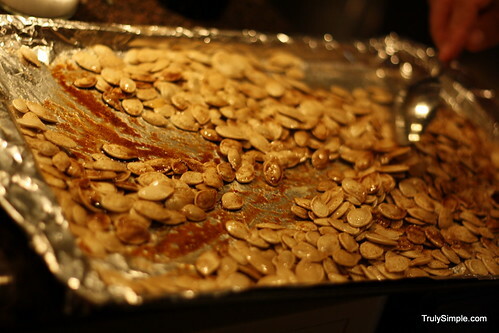 Pumpkin seeds and great friends. I love this time of year so much. 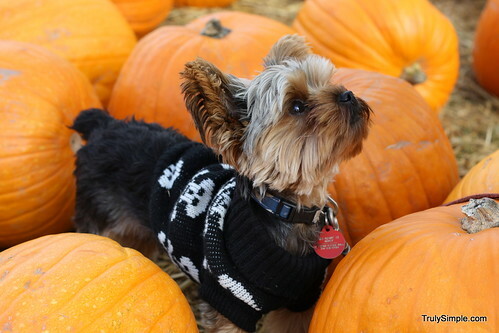 This is the time of year when you can get everything pumpkin flavored! Pumpkin smoothies, pumpkin frozen yogurt, pumpkin shakes, its all awesome. I’m actually at Jamba Juice now writing this as I wait for my pumpkin flavored goodness to get made. 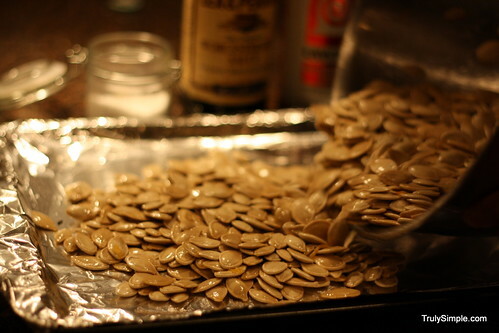 One of my most favorite things about pumpkins are the seeds. 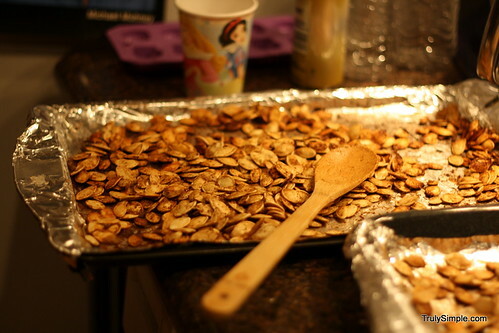 I love making and eating pumpkin seeds. 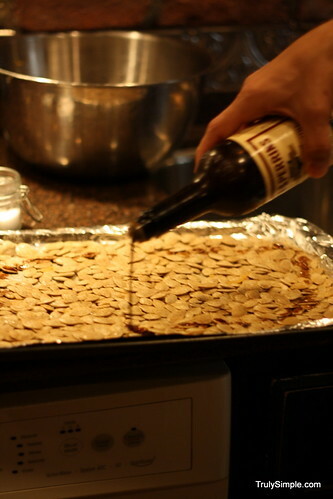 I had the perfect excuse to make some seeds the other day as we celebrated my friends daughters 7th birthday. 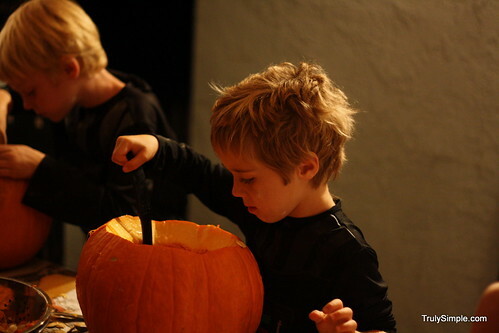 I love carving pumpkins so we had them all over to the house for a big pumpkin carving birthday bash. 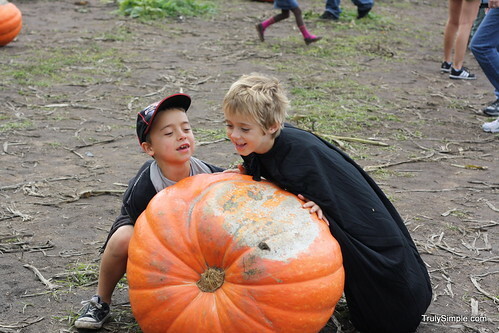 We took all the kids and hit up the pumpkin patch for some over priced pumpkins and some kettle corn. 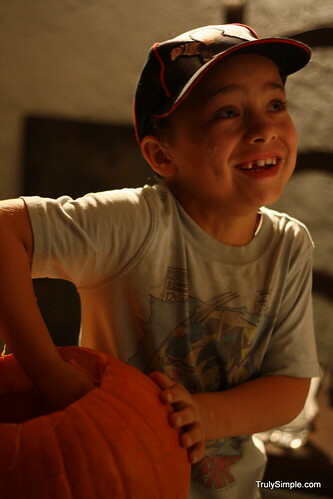 The kettle corn was great and we got some good pumpkins for carving, which means we would have pumpkin seeds! 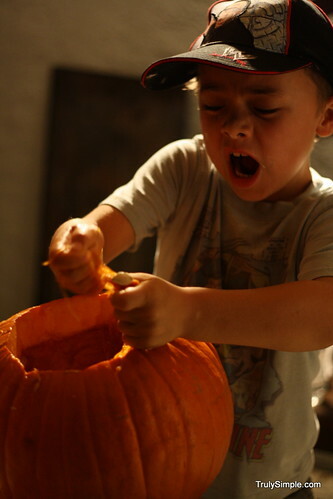 I cut the tops off of all the pumpkins for the kids and set them loose on the guts of those pumpkins. The kids did a great job of making a mess and getting all the guts and seeds out of those pumpkins. 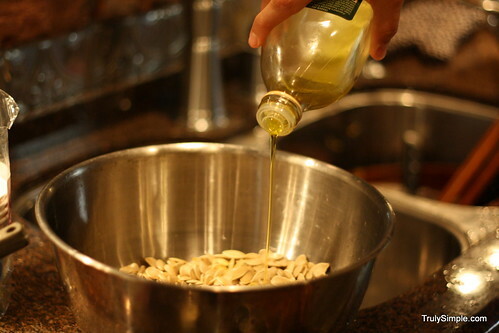 now cleaning off all of the seeds and separating them from the gunk is a thankless job but thats why they taste so good. You had to work for them! 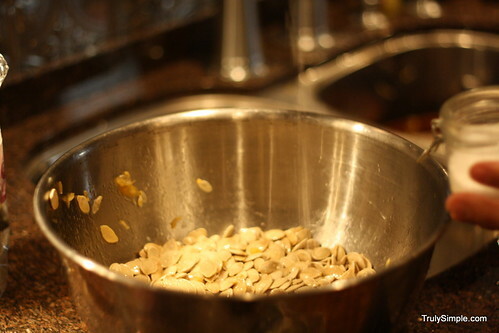 Once the seeds are cleaned off throw them in a bowl. You can stop there if you want. Some people, like my wife, just likes them with salt only. 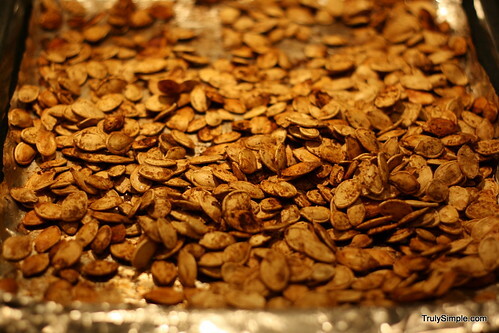 If you want to live a full life and taste the best pumpkin seeds ever, then keep reading. 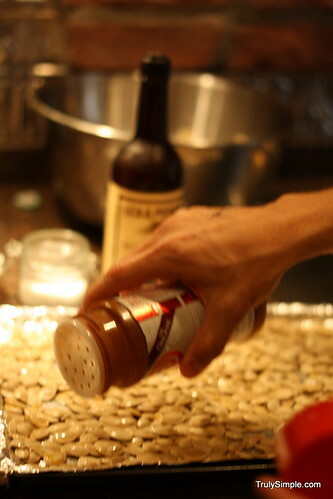 Add Johnny’s seasoning salt. Shake over until there is a light covering. Then add 2 tablespoons of Worcestershire sauce. And start stirring. Mix them all up. Now give another light dusting of salt of Johnny’s seasoning salt. 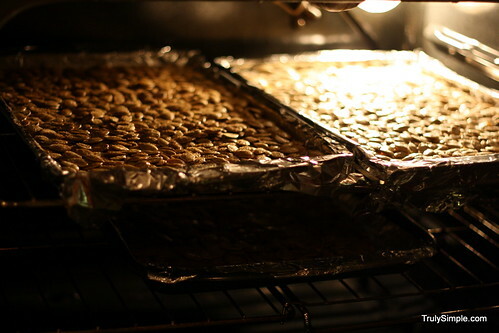 Throw them in the oven set at 300 for 15 minutes. then throw them back in for another 10-15 minutes. Watch for how crispy you want them. Don’t get them too crispy. Seriously look at how awesome those look! 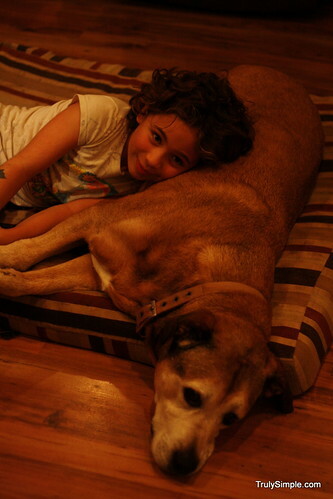 Even the dog was exhausted and happy at the end of the night. 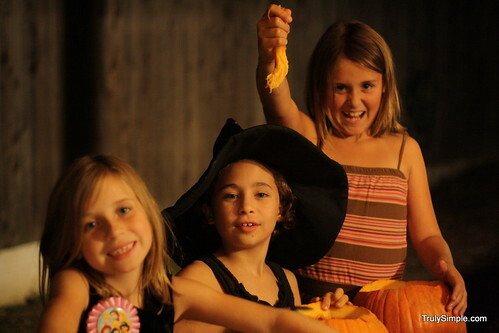 Go out and invite some friends over to carve some pumpkins with you this week and make some seeds and some memories. I’m intrigued by the idea of raising chickens in your backyard both for the health and fun aspects of it. I haven’t committed to the idea yet, but this design makes me want to do it now. Introducing the Nogg by Matthew Hayward and Nadia Turan. The Nogg was displayed at the London Design Festival and it did not fail to capture their attention as well. 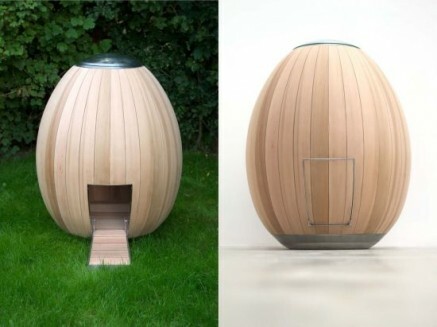 Shaped like an egg, the Nogg chicken coop houses 2-4 chickens in an aesthetically pleasing and fun way. 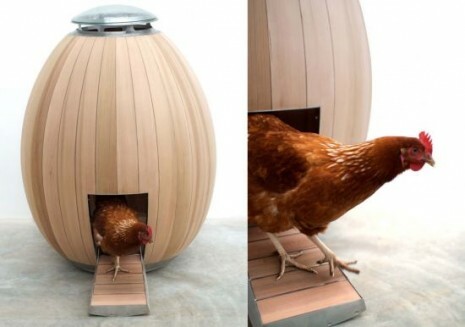 If your looking into raising some chickens in your backyard with some style and fun, check out the Nogg. This post is about getting out and having fun. This past weekend was one of my most favorite events of the year. 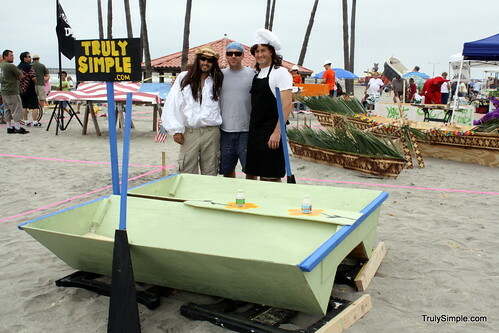 It takes place during our city’s Harbor Days, which is a mix of street fair, arts and crafts, mixed with some pirates and then throw in some good ole MacGyver DIY event called Nail and Sail and there you have it. 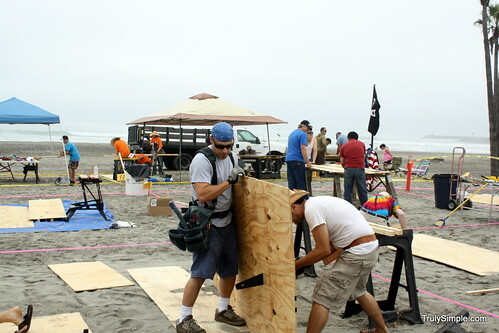 The Nail and Sail is an event by which each team gets a set amount of materials (wood and nails) and must then design and build a boat in 2 hours. 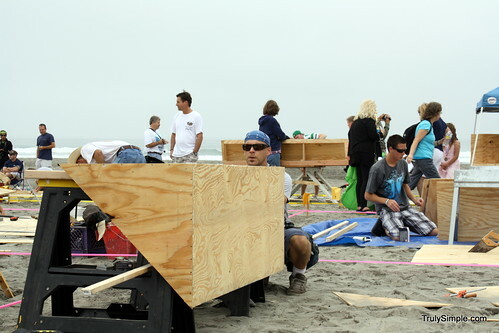 You bring your own tools (no power tools allowed) and you build your boat on the beach and then sail it around the harbor against the other teams. 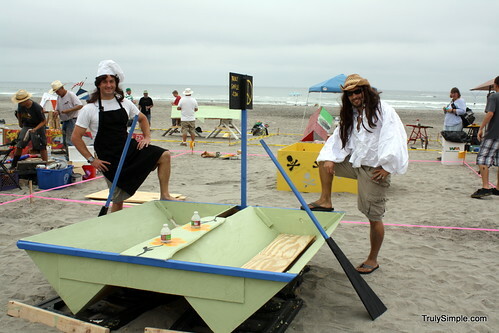 It is so much fun, and this year our boat didn’t sink! 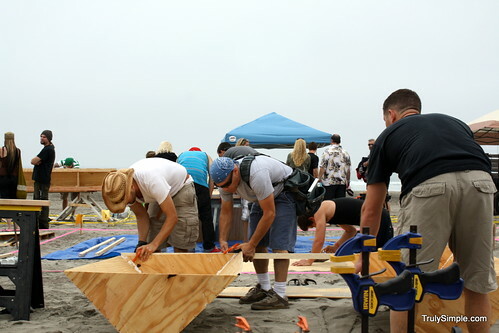 This was our second year of participating in the event. 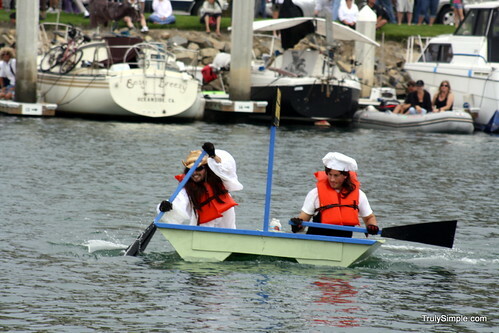 Its a 3 person team with 2 people paddling the boat around the harbor. One half of our boat starting to take shape. The team. costumes count, so we just threw some random things together. We had some extra time so we made cup-holders. The boat with our crew. 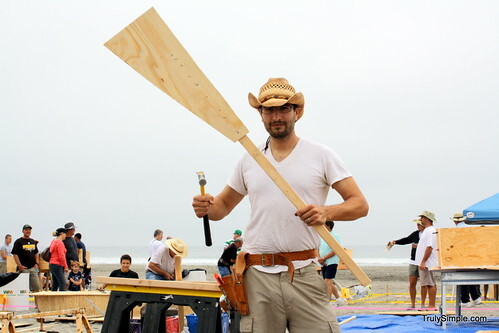 It turns out that while our boat was of solid construction it was not the most streamlined ship ever made and was a lot of work to paddle. 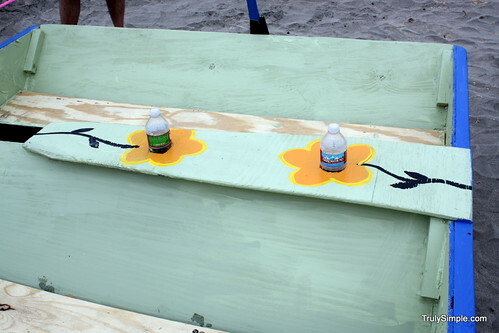 We had so much fun building the boats with the other teams on the beach and loved all the on-lookers with the questions of “you guys are doing WHAT??!. 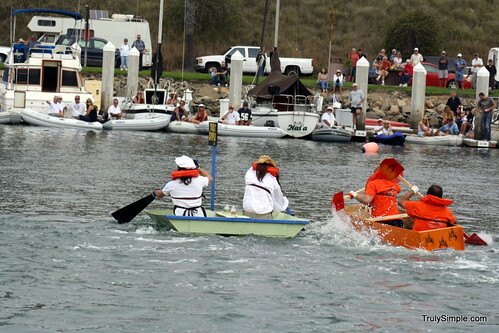 Everyone cheered us on both in building and racing around the harbor. And while we didn’t win (yet), we will be back next year and we are gonna win the whole thing. 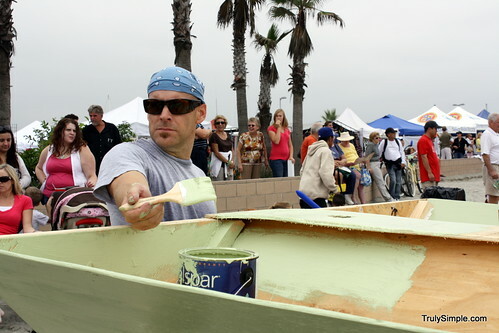 Right now find some local fun event happening in your town. Go online and search our what fun little festival is going on in your town and make a plan to go. Put it on the calendar or go today if its today. There are so many fun things happening in your area all of the time. Get up off of the computer and go find them. Go have fun. Thats your homework. The other day a co-worker asked me how to turn on email alerts in Gmail. I didn’t know the answer and more importantly I asked her why she would want such a thing turned on. She replied, “so I don’t miss an important email”. I followed up with “how often do you actually receive an ‘important’ email?” And thus lies the problem. Most of your email isn’t important. But wait, doesn’t more email mean you are more important? Working harder? More connected to whats going on? I have a bad habit of living in my inbox. Leaving your email open 24/7 and jumping every time the iphone buzzes with a new message. This is a wonderful way to work if you want to get nothing meaningful done. I am working on changing that habit and here’s how I’ve gone about it. This one is easy. The goal here is to reduce the amount of email you get. The first step of this is to eliminate all extraneous emails. Simply unsubscribe from all of those messages that come into your box that you don’t want, you don’t read, and you just throw away anyway. Go through all the messages in your inbox and do a clean sweep of everything you don’t want and get rid of it. Unsubscribe, unsubscribe and unsubscribe some more. Gmail just came out with their Priority Inbox feature which helps a lot with our goal here, but it still isn’t quite where we want to be. 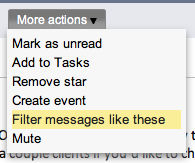 You want to filter your mail so only the really important things hit your inbox. You can still get the rest of the mail, but you just don’t need it in your inbox distracting you. I’m doing this in Gmail but you can do it any email program. 2. Create the filter and select the criteria by which you want to filter. Gmail is great at doing this for you and it will usually filter by the email address, which is fine for this process. You can also filter by the subject or key words if you need to. 3. Now figure out what you want to do with those messages. We want to skip the inbox as much as we can here. You can also select to mark it as read which is great for emails you may want to get and keep but aren’t important to look at. I do that with re-occurring bills that are the same every month. 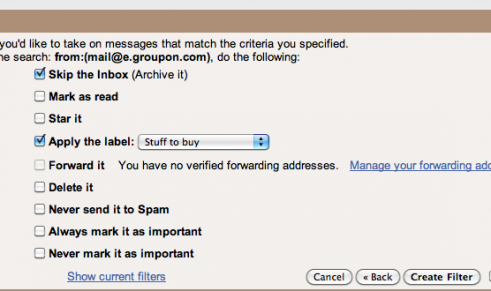 For this example I am filtering all my Groupon deal emails into a filter I call “Stuff to buy”. You can create as many filters as you want. Rinse, and repeat as necessary. Now as you go through your email start unsubscribing from all the crap you don’t need and filtering the ones you want but don’t need to read right away. I only get emails that are important or that I want to read in my inbox. Once I’ve read it it goes in the archive folder. I keep only those in my inbox I still need to do something with, i.e. follow up, or research something on etc. Then on Friday’s I go through and purge everything into the archive folder. The goal (for me) is to have no mail in my inbox. Its a clean slate. A new start. And its a great feeling. I’ve been doing this for several weeks now and here’s what I’ve noticed. As you begin you will feel a great sense of peace sweep over you but you’ll still check those other folders when you see the little numbers next to them. This sensation will pass. 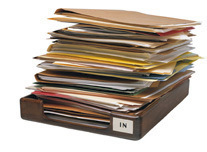 You will soon start checking those folders only once a day, or once every other day, then once a week, then less. Its such a great feeling to not be a slave to email. I now get very little email and I love it. All of it is sorted and waiting for me whenever I get around to looking at it. Turn off push email delivery and turn off sound alerts and vibrations for when mail arrives. Don’t let yourself be setup to be distracted. You don’t NEED to know IMMEDIATELY when you have a new message. That’s what this is about. YOU are in charge of your email and YOU will get around to checking it when YOU want to. Don’t let your phone dictate what you are doing and when you are doing it. This email method allows me to only see important emails in by inbox. All others are sorted and I can dig for them on my iPhone if I want, but I don’t. I hope this works as well for you as it does for me. 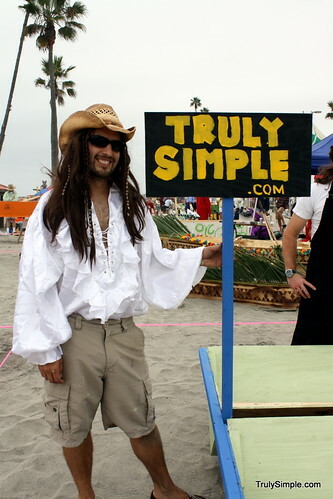 If you’ve got a good tip on managing your email please email me: ben (at) trulysimple.com.